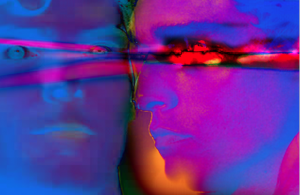 Do you have the gift of laser-like focus? Some of us have minds that jump all over the place, like light reflected off a disco ball. We are focused on a million different things. And the focus keeps shifting. A fortunate few may have learned the power of single-minded focus. We can hold it for a while, but not without intense discipline and training. But every now you meet someone who seems to be a natural. They have what it takes to focus all their energies (both head and heart) on a single task and keep at it while the rest of us are getting on with other things. If this is you, take a look at your palms. Quite likely you have two major lines on your hand instead of three. Officially this marker is called “A Simian line”. The energy of the heart and the head are sharing one cable instead of two. Positive side: tremendous focus, negative possibility: misunderstandings due to scrambled messages. If you or your child has a Simian line my advice is DO NOT read up all the garbage posted online about this hand marker. Save yourself the effort and instead find something you are really passionate about to focus all your energy on. 1. Not knowing what your passion is. People may think you are being aloof when you think you’re being kind and considerate. This is the down side of having head and heart fused. Save yourself from crossing swords unnecessarily by always double checking your communication – ask what the other person heard or if you interpreted them correctly. More on the Simian Crease – here is a video and a 90 Minute class. 3% of people in the USA have a Simian. This percentage is much higher in Asian countries. So the vast majority of people with a Simian crease are perfectly normal. This image below roughly shows you how this link between Downs and the Simian line has been blown out of all proportion. If you would like to know more about this marker you can access a 90 minute class exclusively on this topic. Partial or nearly Simians, double Simians, and a lot more about the characteristics, strengths and weaknesses of this marker in genreal. Plus advice to people with this marker and to parents of children with this marker. Here is another article I wrote about this marker a couple of year ago. 5 comments to Do you have a Simian line? I have the Simian crease and can understand the intensity that is spoken about. I have two totally different hand markings which have fascinated me since childhood but I have never had the courage to delve further than the odd read. I am now very interested to learn more. I have simian line in my right hand. I am totally normal physically and mentally, am I down’s syndrome? Raju, no! You would not be writing this if you had Downs! 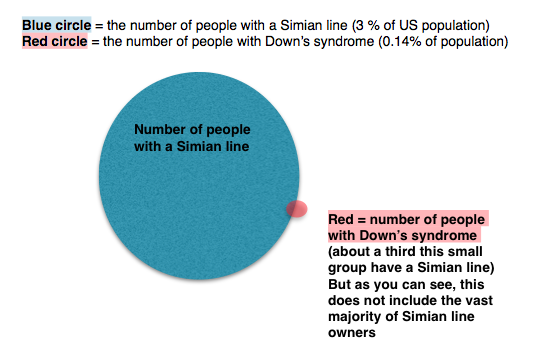 only a very very tiny percentage of Simian owners have Downs syndrome BUT 30% of all Down’s syndrome people have a Simian. See the diagram I drew on the link below to explain this further. Most Simians are above average in intelligence. Enjoy your gift!